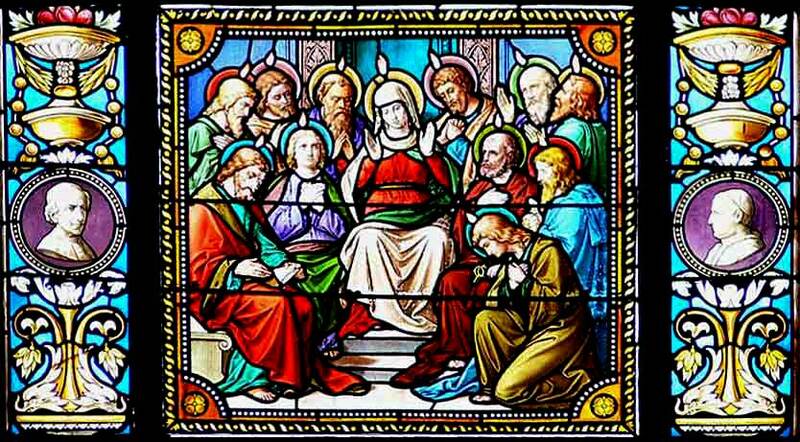 Stained glass window from the Church of St. John the Baptist, Wuchzenhofen, Germany, depicting the Pentecost. Our “Virtual Sunday Church” this week takes us to the First Plymouth Church in Lincoln, Nebraska. Turn up your volume: this is very soft and it is beautiful! Lord God, I remember and pray for all those suffering severe financial problems; the unemployed, the homeless, the bankrupt, the hungry, and those in desperate fear of such problems. If it is your will, I pray that they can find a way out of their difficulties, into financial stability. May I never close my eyes to them. And may your Holy Spirit be with them, to comfort and lift them up in Spirit, that they might never despair, but find total joy in the promise of the life to come. 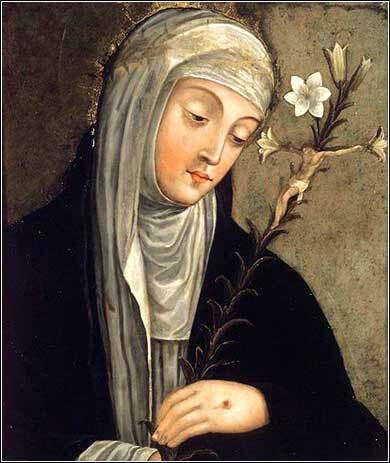 Saint Catherine of Siena, artist unknown ca. 1680. My brethren, do not hold your faith in our glorious Lord Jesus Christ with an attitude of personal favoritism. For if a man comes into your assembly with a gold ring and dressed in fine clothes, and there also comes in a poor man in dirty clothes, and you pay special attention to the one who is wearing the fine clothes, and say, “You sit here in a good place,” and you say to the poor man, “You stand over there, or sit down by my footstool,” have you not made distinctions among yourselves, and become judges with evil motives? Listen, my beloved brethren: did not God choose the poor of this world to be rich in faith and heirs of the kingdom which He promised to those who love Him? But you have dishonored the poor man. Is it not the rich who oppress you and personally drag you into court? Do they not blaspheme the fair name by which you have been called? If, however, you are fulfilling the royal law according to the Scripture, “You shall love your neighbor as yourself,” you are doing well. But if you show partiality, you are committing sin and are convicted by the law as transgressors. For whoever keeps the whole law and yet stumbles in one point, he has become guilty of all. For He who said, “Do not commit adultery,” also said, “Do not commit murder.” Now if you do not commit adultery, but do commit murder, you have become a transgressor of the law. So speak and so act as those who are to be judged by the law of liberty. For judgment will be merciless to one who has shown no mercy; mercy triumphs over judgment. We have a guest commentary today, from Dr. Ken Boa of Atlanta. The truth of Scripture was revealed not only to change our way of thinking but also our way of acting. Without an active response of obedience, it cannot accomplish its purpose in our lives. But before we can respond to the truth we must know and believe it. There is a reciprocal relationship between belief and behavior: just as attitude leads to action, so action creates or reinforces attitude. Faith grows as we plug it into life. hen we put a principle into practice, the principle becomes more real to us, which then makes it easier to practice, and so forth. A loving attitude toward another person leads to loving actions on that person's behalf. But the other side of the coin is that by acting as if we love another person, our attitude toward him or her actually moves in that direction. In the same way, there are times when we may not feel like doing what the mirror of the Word tells us to do. But by God's grace we can choose to do it regardless of how we feel. “For it is God who is at work in you, both to will and to work for His good pleasure” (Phil. 2:13). Faith in Christ is not theoretical but intensely practical, and this is the theme of the epistle of James. James sets forth an important principle in 2:1 and develops it in 2:2-13. The principle is that believers should not make judgments on the basis of outward appearances. “My brethren, do not hold your faith in our glorious Lord Jesus Christ with an attitude of personal favoritism.” In the Greek, “personal favoritism” is a compound of the words “face, outward, surface” and “receive.” Those who have placed their trust in Christ should not receive others on the basis of externals; they should look beyond the surface to the level of inward character. For if a man comes into your assembly with a gold ring and dressed in fine clothes, and there also comes in a poor man in dirty clothes, and you pay special attention to the one who is wearing the fine clothes, and say, “You sit here in a good place,” and you say to the poor man, “You stand over there, or sit down by my footstool,” have you not made distinctions among yourselves, and become judges with evil motives? (Jas. 2:2-4). Such distinctions in the assembly of believers destroys the unity which Christ made possible. “There is neither Jew nor Greek, there is neither slave nor free man, there is neither male nor female; for you are all one in Christ Jesus” (Gal. 3:28). These distinctions also reveal the impure motives of judging others in terms of their social status and their ability to provide financial assistance. This stands in stark contrast to the “pure and undefiled religion” of James 1:26-27 which seeks to minister to others without expecting something in return. Continues next Sunday . . . .